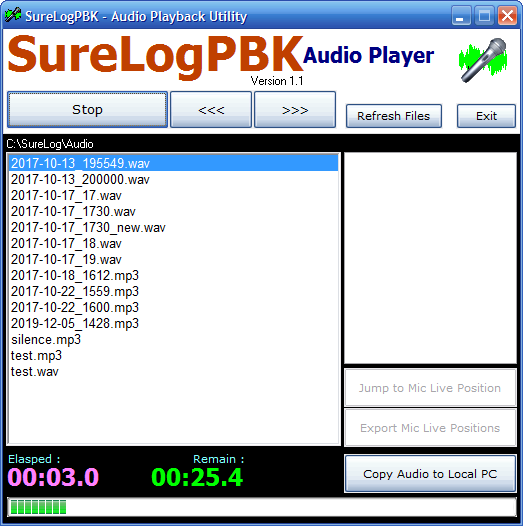 SureLog is a broadcast logging application designed to record hourly audio files in either MP3 or linear PCM (WAV) format. It can create a new file at the start of each hour and name them according to the current date/time. It offers a very simple interface, auto-start, a simple layout – Start/Stop control, Settings, LED indicator, VU meter, audio properties as well as a dead-air detector. Keeping a log of your station (or studio) output is a good idea – Especially as it may be part of your licence conditions. All OFCOM-licensed stations in the UK are required to keep an audio log for 42 days. OFCOM take a dim view when copies of your output can’t be supplied – Why risk a fine or licence breach? Records continuously or can be manually controlled using the joystick port: ideal for use as an aircheck/snoop recorder! It is intended as a “set it and forget it” application that continuously logs your station’s output. It records direct to MP3 on-the-fly with no need for batch operations to encode bloated linear audio for archiving. Just set the sound device, audio format, path to files and hourly/auto options and you’re away! SureLog is ideal for Community/RSL stations as well as Commercial users – the price (and support) is always the same. To record a long (more than 1 hour) programme – disable the Hourly Files option and manually start/stop SureLog. The filenames are named in the YYYY-MM-DD_HHMMSS format. To use multiple copies of SureLog on the same computer – purchase a single activation key, register the software and then make copies of the SureLog program folder for each additional input you wish to log. You can then record multiple feeds providing you have the audio devices available. Complaints will be dealt with in the same way as for other licensed radio services. Licensees will be required to make a recording of all output transmitted, and to retain recordings for a period of 42 days from the date of broadcast. The licensee must, at its own expense, make these recordings available to Ofcom for monitoring purposes and the investigation of complaints. The licensee should make appropriate provision for spare recording capability to enable continuity of recording in the event of a breakdown or routine maintenance. Failure to provide a recording of output when requested by Ofcom (in the course of the investigation of a listener’s complaint, or for any other reason) will be considered a serious breach of licence conditions.